That’s a beautiful bat flip. 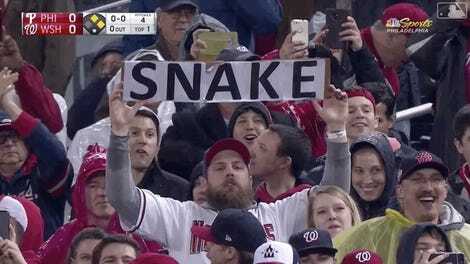 If there were any questions about how Nationals fans would greet Bryce Harper in his return to Washington, they were answered well before first pitch. A tribute video—the thing that usually inspires warm fuzzies, before the rancor begins—was played on the scoreboard and booed vociferously. Then Harper himself was booed. And booed and booed and booed. “I heard the boos,” Harper said, “and just remembered that I had 45,000 people and more in the city of Philadelphia that were screaming at their TVs cheering.” Some Philly fans weren’t in front of their TVs, though, or even in Philadelphia. Some number of them, maybe a couple thousand, were in Nationals Park. You could see them in the crowd if you looked closely enough, but you couldn’t really hear them yet. Not over the boos. But they could wait. The rain helped, delaying the game 41 minutes and pushing the final out that much closer to the moment the Metro would stop running. The Phillies offense did the lion’s share, though, chasing Max Scherzer after five and then beating up on the bullpen for an 8-2 Phillies win. And Harper? Yeah, he can hit in D.C. (We knew that already.) Harper was 3-for-5 including a homer and three RBI. It was Harper’s sixth-inning single that made the game 6-0, and sent a whole bunch of soggy, dejected Nationals fans heading for the exits. So when Harper jogged out to right field for the bottom of the inning, mostly Phillies fans were left to greet him. And by the eighth, when the ballpark was even emptier of Nats fans, Harper’s two-run dinger sounded like it came before a home crowd. By the final out, the remaining crowd was no longer even slightly mixed. 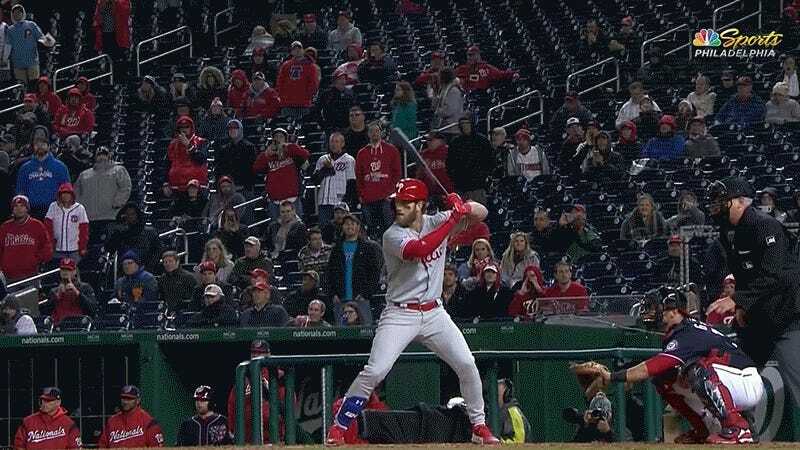 It was just Phillies fans chanting M-V-P, and the Phillies were exchanging post-win handshakes, and there was Harper, on the field in Washington again but this time in road grays, just the first of many, many times over the next 13 years.